alaTest a collecté et analysé 56 avis de consommateurs et d'experts pour le produit Lenovo IdeaTab 2258A1U S2110. La note moyenne du produit est 3.4 sur 5, tandis que les autres produits de même catégorie ont une note moyenne de 4.3 sur 5. Les testeurs apprécient la batterie. Les performances de la batterie impressionnent, mais de nombreux avis ont des doutes sur la qualité de construction. Après analyse des notes de consommateurs et d'experts, de l'âge du produit ainsi que d'autres facteurs, et comparé aux autres produits de même catégorie, le Lenovo IdeaTab 2258A1U S2110 obtient un alaScore™ de 86/100 = Très Bien. The IdeaTab S2110 is a competent and durable Android tablet hybrid that's priced a bit too high for the experience it offers. The IdeaTab S2110 is the kind of tablet that looks good on paper, but doesn't quite deliver once you get it into your hands. Hands-on preview: Keyboard'ed Android tablet with up to 20hr battery life. However, we will say that aside from the Transformers, this Lenovo IdeaTav S2110 is perhaps the only convertible Android tablet we can see ourselves recommending to others. We'll see what it's really capable of when we get cracking with the full review. The Lenovo IdeaTab S2110A is an average large-screen Android tablet with an excellent optional keyboard dock, but there are better and less expensive options out there. Thin and light. Great optional keyboard dock. Bright display. Build issues. Choppy performance. Subpar camera. For about $370, the Lenovo IdeaTab S2110A offers an impressively bright screen with wide viewing angles, fast gaming performance, dual cameras, Micro-HDMI, and a useful keyboard/dock option (about $480 for the tablet and keyboard/dock combo). The Lenovo IdeaTab S2110A features fast gaming performance, a bright screen, wide viewing angles, dual cameras, and Micro-HDMI. The design is shoddy and screen warping is rampant when handling the device. Its price is too high given the quality and quantity of its offerings. The Lenovo IdeaTab S2110A offers a great-looking screen and fast gaming performance, but comes up short in build quality and features. It's not exactly a new concept, but the quality of the S2110A can't be denied. That price point is encouraging, too - even if tablets with Full HD screens are now entering the market. Which does beg the question - why now? Summary: Lenovo has introduced an Android tablet with optional laptop dock to go head-to-head with the Asus Transformer line of tablets. 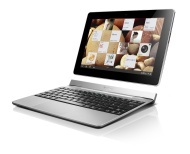 The 10.1-inch IdeaPad S2110 has a beautiful screen and the dock provides the best laptop in the genre.